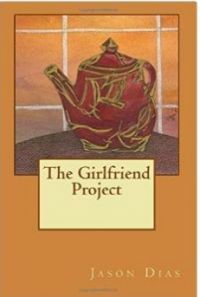 The Girlfriend Project (2014) by Jason Dias is not your typical novel about love. Although it could be considered a romantic novel given that its focus is a love story, the plot is more existential in nature. Embedded in this unlikely love story is an exploration of the nature of love and other emotions. And love takes center stage. Ernest has been diagnosed with Asperger’s disorder and appears to accept this diagnosis as it explains many of his life challenges. Emotions, especially love, befuddle him. His recognition of emotions is not through the usual subjective process, but instead through a rather detached, somewhat objective analysis of his behavior. From his wife and his therapist, he learns to identify many emotions even if he does not emotionally identify with them. At the beginning of the novel, Ernest characterizes himself as rather dependent upon his wife, who dies early in the novel. Because of his wife’s encouragement from before her death, he agrees to enter therapy after she dies. He does so and finds a therapist that appears to be a pretty good match. Upon encouragement from this new therapist, he begins considering dating. However, Ernest clearly does not have much confidence or know-how in the dating department. He hires Jenny, a down-on-her-luck waitress to be his girlfriend. Jenny is attractive and socially more skilled, but also has struggled in her own pursuits of love. Out of desperation from her current financial and life predicaments, she agrees. From this very unusual situation, the love story begins. Ernest and Jenny’s relationship traverses several unexpected twists that lead Ernest into an exploration of his childhood and his relationship with his wife. Meanwhile, Jenny has a dramatic encounter with a previous lover, which introduces an element of action to the novel. With these elements, Dias is able to keep the reader engaged at more than just the psychological level. The exploration of the meaning of love has almost become cliché. Yet, this question is so essential or our very existence that it does not wear old as with many clichés—at least not when explored with sufficient psychological depth, as Dias does. But Dias adds an interesting twist: How do we understand, know, and experience love without the typical emotional understanding that most people rely upon. Dias begins his exploration of love by taking away the most common guide to recognizing it: our subjective emotional experience. He also calls into question the many overly simplistic answers often offered by the cynics. Dias, through Ernest, recognizes that there is something important in love, even if the particular lesson eludes him. Although Ernest seems resigned that he will never know or understand love, he continues in the pursuit, even if not recognizing that it is love he is pursuing. The description of the book says that it is an answer to Camus’s The Stranger. In a similar way to how Camus encourages the reader to examine what it means to be human, Dias lures the reader into examining what it is that they consider love. In the end, Ernest still may not understand love, but he has become convinced that it exists. Many existential writers, at the end of their pursuit of meaning, seem to end up with answers in the genre of love, compassion, and relationship. Rarely, however, are the answers clear. Indeed, love may never be clear. It is at once the most compelling and elusive of the emotions. Dias, as a good existentialist, does not pretend to have solved the problem of love. He does, however, provide us with some important paths to explore in its pursuits. He also leaves us with the belief that love, even if we cannot fully comprehend what it is, is well worth pursing. This is a novel well worth the time for those interested in existential psychology. Or even those just interested in examining the nature of love.